I once again have proof that plants are resilient and will grow and re-grow even when they are kicked, stepped on, trampled, and otherwise beat to the ground. My proof is this particular clematis which is on its third life, at least. I thought it was a goner after the patio re-do back in 2010. The removing of pavers and the addition of a better base for the pavers kicked up a lot of dust, covering this clematis during a hot spell in July. Plus, the workmen kicked it, stepped on it, trampled it, and otherwise beat it to the ground while working on the patio. Once they finished the patio, I washed off the clematis, cut it back and figured it was a goner. I was as wrong as wrong can be. As wrong as a fig flower. 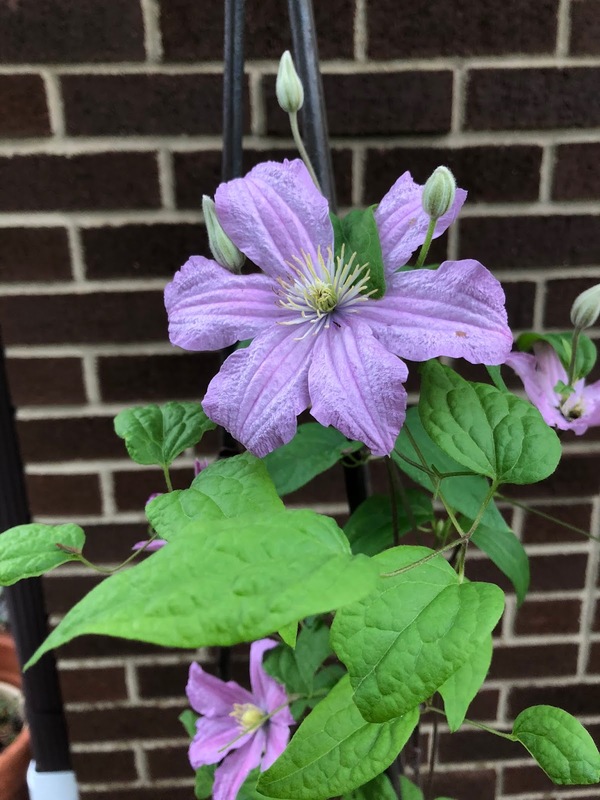 Then this summer, in August, more workmen came and kicked the clematis, stepped on it, trampled it, and otherwise beat it to the ground when they dug a trench to re-route a downspout. The clematis has grown at least three feet in a month's time and is once again blooming. I'm glad I like this clematis because it appears it is never going away. Ever. I had plants squashed by roofing material when our roof was redone a couple of years ago. I had fears - but they ended up coming back the following year. Plants are sometimes unexpectedly survivors- but then again, I've had enough disappear after a winter's hardship that were supposed to be hardy here in my zone 5b climate. Earlier this past Spring, we had a patio put in our back yard. The workmen dug up a Brunnera because it was in the way of their motorized wheelbarrow. They did not tell me. A week later, I found it exposed in a very sunny location. I replanted it with hopes that it would make it. It took awhile, but it did recover. Rosa Nitida. Dug up by a backhoe digging a drainage trench and lost forever. Or at least for 3 years... reappeared this year.